Julia Dault is known for richly textured paintings on pleather, silk, and spandex, and for sculptural works fixed to gallery walls with string and knots. 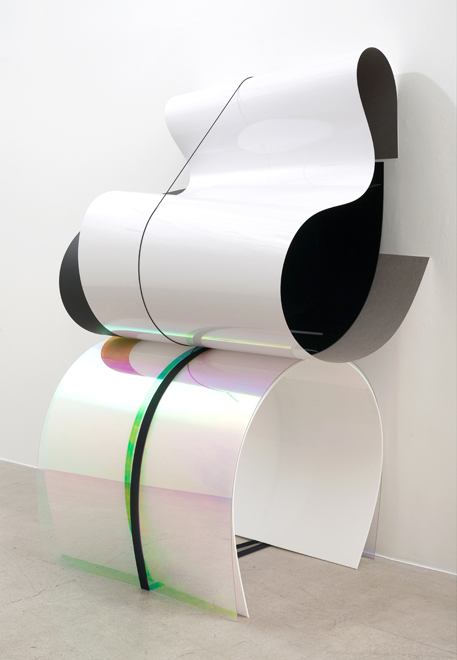 Plexiglas, formica, and Everlast boxing wraps—Dault’s materials of choice—lend her sleek abstract sculptures a raw, industrial aesthetic, while they retain a certain naturalness through their rounded organic forms. In her paintings, Dault likewise focuses on depth and materiality by building up colorful layers of paint and vinyl and then scraping parts away.